Dubai today throbs with activity, shines with wealth and jives with myriad exciting activities. So how does a city go from A to Z without gathering any fascinating titbits along the way? No way. So here are 5 interesting, fascinating, totally whacky facts about Dubai. Police Force or Movie Stars? You Decide! So what do you do if you are a cop and fail to catch your culprit because they were too fast for you? Well, you speed up too! Many people in Dubai are uber-rich and don’t drive well-behaved Chevys and Fords and Toyotas. No – they drive supercars, whooshing along the spotless high-speed highways like there’s no tomorrow. And the cars they flash? Let’s talk Lamborghini Aventador ($397,000), Aston Martin One-77 ($1.79 million), Ferrari FF ($500,000) and others, even more expensive. So now Dubai police have been equipped with speedy supercars. With what one of these cars cost, you could send several kids to college in the USA. Here’s how much New York University charges for a four-year college degree – $248,000 dollars. Just a little bit less than what it costs to buy a Lamborghini Aventador. And New York University is one of the most expensive colleges in the US. Just some everyday Dubai facts for you! Uh? Which hotel? The Burj Al Arab, of course! Did you know that this hotel, the world’s first 7-Star hotel, actually uses enough gold to paint over the Mona Lisa 46,265 times? The hotel’s interior is actually covered with approximately 1,790 square meters of gold leaf. Not 14 carat, not 18 carats, but pure, 24-carat gold leaf. The Burj al Arab offers a degree of unapologetic luxury that flattens even the uber-wealthy among us. You’d have to be a royal to get used to the gold leaf, embroidered silk wallpaper, leopard upholstery, private 212-meters large rooftop helipad and more. The hotel has one of the world’s largest fleet of Rolls Royces at its guests’ disposal as well. More than 258,000 square feet of floors and walls are covered by the most expensive and rarest Italian marble – Statuario. True stuff – over-the-top indulgence and the best of everything – it’s just one of the honest facts about Dubai. Last we heard, Michelangelo used this marble to create his masterpieces. The spacious bathrooms come with a huge Jacuzzi and a full set of Hermes toiletries for Him and Her, including perfume and eau de cologne. At the Al Mahara restaurant, after you pass through a golden arch entrance, the first thing you see is the ginormous blue aquarium in the middle. The tables are arranged around this sea-water tank. So if you’ve been up on the Burj Khalifa observation deck and marvelled at the view, you need to check out the inside of the Burj al Arab. We’re still marvelling. Robots Ride Camels, Not People! Camel racing to the Middle East is what football or baseball is to the USA and hockey is to Canada. 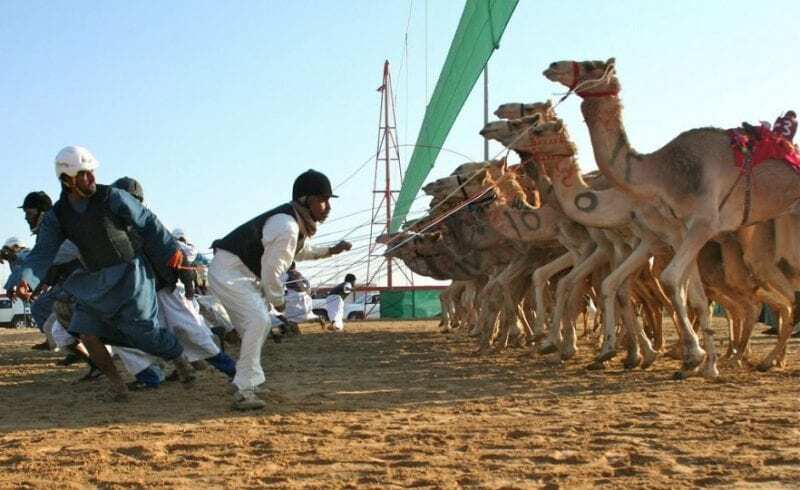 It’s an ancient sport and the nomadic tribes have been racing their camels wild in the dusty desert for ages. Here’s the catch though – given the camel’s size, only young kids can ride them during a race. Of course, Dubai’s residents wouldn’t allow their precious children to race the cantankerous creatures. What then? Apparently, children were illegally trafficked into Dubai to race camels. Of course, there was a global hue and cry over this and we are glad to report that young kids will no longer be misused like this. The solution? Dubai has money to spare and now we have child-sized robots to race the camels. A single robot, endowed with superior electronics, artificial intelligence and the rest of hoo-hah can cost anywhere from $300 to $10,000. Would any other city have come up with this solution? Dubai’s Latest Exploit? A Climate-controlled City, Twice the Size of Monaco! Ever read Stephen King’s novel ‘The Dome’? It was even made into a 3-season TV show. Well, Dubai is building its own dome over a completely climate-controlled city. This city will be 4.45 km² in size, that’s two times the size of the world’s smallest monarchy, Monaco. This futuristic city will be well connected by air-conditioned boardwalks. Aptly named the Mall of the World, this domed city will house hundreds of buildings. By the time it’s ready, there’ll be a transit system in place, plus 20,000 hotel rooms and the world’s largest indoor theme park as well. That apart, this city will have a medical tourism district for those who want to get well in style. There’ll be 7 kilometres of shopping streets, a cultural district similar to New York’s Broadway and a Celebration Center with the capacity to cater to 15,000 guests. Whew! The promotion for the Mall of the World actually states that people can stay in the domed city for an entire week without having to drive a car or leave the city. So that’s it – if you’re one of those who finds Dubai’s climate unbearable, just wait for the domed city to be completed. Cheetahs, Tigers And Lions Banned As Pets! We’re not kidding. As of January 2017, the UAE has banned cheetahs, lions and tigers from being kept as pets. What again? Well, if you must know – the city’s oil-rich residents who are into uber-everything from cars, homes, personal effects and lifestyle can’t deal with regular domestic pets. Our regular retrievers, Labradors and little kitties would never satisfy their need for a personal status symbol. No sir. It had to be wild animals – glorious, unspeakably dangerous, deadly wild animals from different parts of the world. Seeing a man walking his leopard or cheetah on a chain leash was a common sight in Dubai’s fancy areas. Seeing a tiger’s head hanging out of the passenger-seat window of a supercar on highways – also a common sight. Just not anymore. Anyone seen in public taking their tiger or lion for a walk (you simply have to read that twice!) will have the animal confiscated. Plus, there’s a stiff fine to pay – $136,000 (700,000 Dirhams) or six months in jail on refusal to pay up. Why this now? Well, the Gulf country has been undergoing years of pressure from animal welfare groups from around the world. So now it is law. If some people still keep wild animals as pets, they’re probably exercising them on their magnificent estate lawns. With wild pets banned, one would think the UAE is finally joining the rest of the world in its normalcy. However, when you hear of developments such as the Mall of the World, you wonder. What else does Dubai have up its sleeve, just ready and waiting to stun the world with? We’ve got to just wait and see. Thanks to Neha for her guest post today!